We are one of the leading manufacturers and suppliers of Crape Fabric. The offered crape fabric is a synthetic fiber fabric which is known for the crisp and crimped appearance. Our supplied crape fabric is widely acclaimed by girls and women of all age groups and sections. 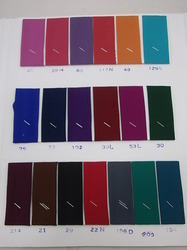 The offered crape fabric is liked for color fastness and crimped appearance. We feel proud to introduce ourselves as the well-known manufacturer and supplier of Polyester Crape Fabric. The offered polyester crape fabric is very widely appreciated for the crimped appearance. Our supplied polyester crape fabric is highly liked for elegant patterns and lovely designs. The offered polyester crape fabric is available at very affordable rates. We are one of the well-known manufacturers and suppliers of Pure Georgette Saree. The offered Pure Georgette Saree is liked for beautiful patterns and lovely designs. Our supplied Pure Georgette Saree is very popular among women of all age groups and cultures. The offered Pure Georgette Sareeis highly appreciated for color fastness and elegant designs. We are one of the well-known manufacturers and suppliers of organza febric The offered rayon print d fabric is widely appreciated for intricate designs and lovely patterns. Our supplied rayon print fabric is liked by girls and women of all age groups, sections and ethnicities. Looking for Crape Fabrics ?